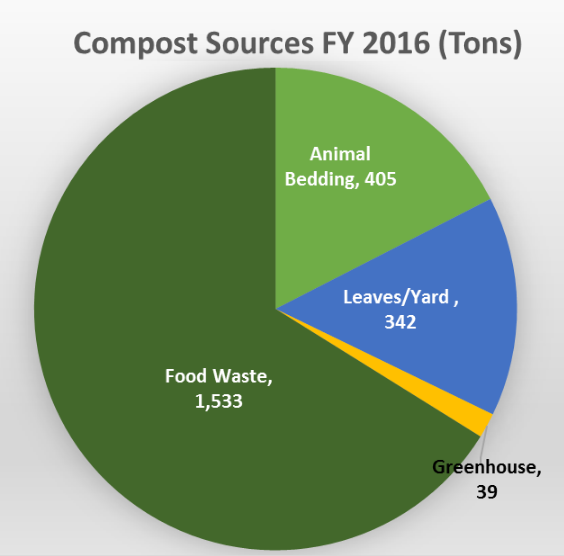 The food waste composting program kicked off in 1996 with the state grant of a $100,000 worth of equipment (Wright In-Vessel or IVC) and a DEP approved compost windrowing site. The IVC was designed to process 1,500 lbs per day of food waste and 1,500 lbs per day of wood chips/leaf waste. From day 1, the IVC failed to produce finished compost in the prescribed 28 day cycle and couldn’t handle the daily volume (then 400 tons/yr). As a result, we sped it up to handle more material – in part so that the more problematic loads (meat, fats etc.) could be rendered manageable before hitting the compost pad for windrowing. When we ceased the use of the IVC in 2001, it was handling only about 1/3 of our food waste (total - 600 tpy) and that third had to be windrowed anyway to complete the composting process. We decided not to fix the IVC when a $2,000 drive gear required replacement and we were looking at off campus composting of food waste anyway. The IVC was not – we believe – the source of any odor generation or neighbor complaints. 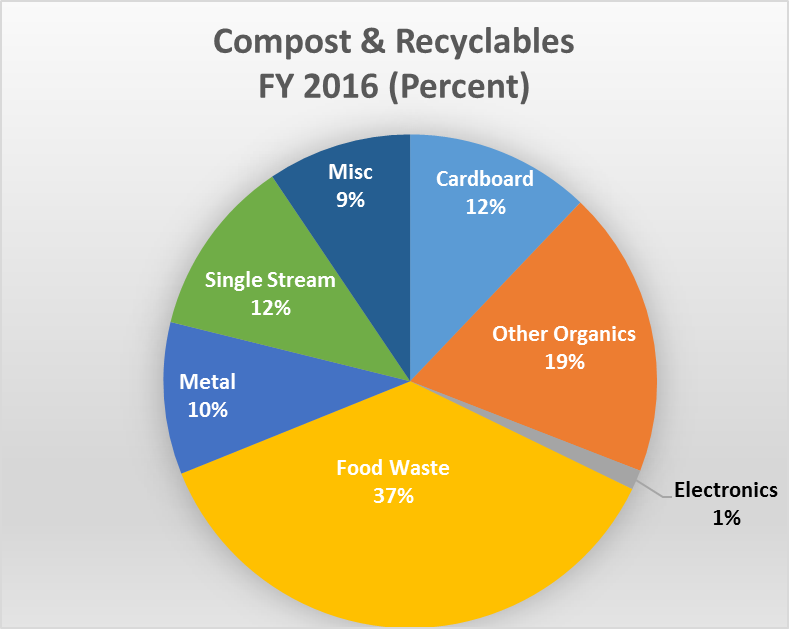 In 2002, while making short term arrangements to compost food waste off-campus, the Plant decided to fund a consultant study of site and technology options (and associated costs) for both trash transfer and food waste composting. That report confirmed what DEP was requiring relative to the WRTF operation. Odor and seagull management, in the tight quarters we shared with a residential neighborhood, would demand an enclosed composting operation. Three of the 4 technologies evaluated relied on processing enclosures of one kind or another. The fourth, a slightly different version of what UMass had already been doing for 6 years, employed a specially designed Windrow turner to mix and aerate the windrowed food waste – instead of a bucket loader. The next to most “low tech” alternative evaluated was the Ag-Bag system. The costs estimates for the “Windrow Turner” and the two Ag-bag alternatives were just under and just over $100 per ton - but neither would adequately address the DEP requirement for process enclosure in a non-farm location with residential (even dorms and classrooms) abutters. The odor/vermin/noise friendly (prevention wise) technologies (the Comptainer – Invessel and the Agitated Bay In-Vessel) could have worked at two or more sites but the upfront costs ($1 to $1-1/2 million in 2002 pricing) and cost per ton to operate were prohibitive, i.e., in the $190-$200/ton range. At the time, the benchmark for cost comparison was what we understood to be a relatively viable and secure option (at least for the foreseeable future) – of hauling food waste to area farm operations for composting. The cost at the time was about $40-45/ton (not considering the $25/ton lost revenue value for the finished compost) and the benefit was fewer administrative and public relations headaches. Several of the 12 sites reviewed by the consultants were eliminated for failing to surmount exclusionary criteria such as high ground water levels and wetlands (Wastewater treatment plant - north, McGuirk stadium west and Hadley Farm – north). Several more were ranked low on the basis of preferential criteria such as adjacent land use, traffic safety and visual, noise or odor buffers (the WRTF site, WWTP – north, Wysocki meadows, Old Power Plant west, Belchertown orchards and Governor’s drive. Left for further consideration and site development cost estimating were: Old Power Plant east, old Trailer storage yard and Deerfield farm. Deerfield was eliminated from consideration due to its distance from the center of waste generation on campus. Essentially, the project of returning the food waste composting process to the UMass Campus was abandoned due to a combination of factors. The simplest trash transfer system and site was found to be suitable and cost-effective at the existing WRTF site. Since this site was not also viable for the low tech composting alternatives (Ag-Bag or windrow turning options), economies of scale in site development and construction for composting were unavailable. The WRTF was both an unsuitable site for the cheaper composting technologies and also, conversely, a quite suitable site for the unaffordable technologies. Too wet and inaccessible – Old trailer site (the CHP siting process may also have been in competition with this site at the time).